Have you ever needed to parse an text to get a list of email addresses? Maybe recent users need to be notified of a change and their email information is in an unstructured log file? Maybe marketing handed you a text dump and you need real emails for their campaign? Introducing our Email Extraction tool! Located on our “More” Tools page, Email Extraction can save you time and energy when you need a list of email addresses, or domains quickly from unstructured text. Pasting an email from a recent email campaign. Only Domain – Trims the list to only the domains of the email addresses. This entry was posted in Knowledgebase and tagged Email Extractor, New Tools on July 30, 2015 by MxToolbox Blog. Have you ever needed to lookup DNS on a large list of IPs? How about parsing a security log to see where a potential threat is coming from? Combing through the log and getting the full list of IPs can be tedious and tiresome. And, then you still have to run the DNS checks one-by-one or write a script to do it for you. That’s right, we’ve launched a DNS Batch Lookup Tool that does all that for you. Available to all MxToolbox Professional users, DNS Batch Tool eliminates the time-consuming work of parsing text for IP addresses and repetitive DNS lookups. You can find it on the main menu of the MxToolbox Professional interface* along with our premium monitors like DNS Zone Protect and MailFlow Monitoring. DNS Batch Tool provides takes simple text as the main input. As, you can see below, I’ve copied an entire email into the tool so I can see lookup routing information for my most recent campaign. I could also use security logs or a pre-generated list of IP addresses. DNS Batch Tool parses the text file and automatically extracts all the IP addresses. Processing these IP addresses yields reverse host name, country, region and city information, AS number and AS name. Note: you must be a paid user to access MxToolbox Professional. 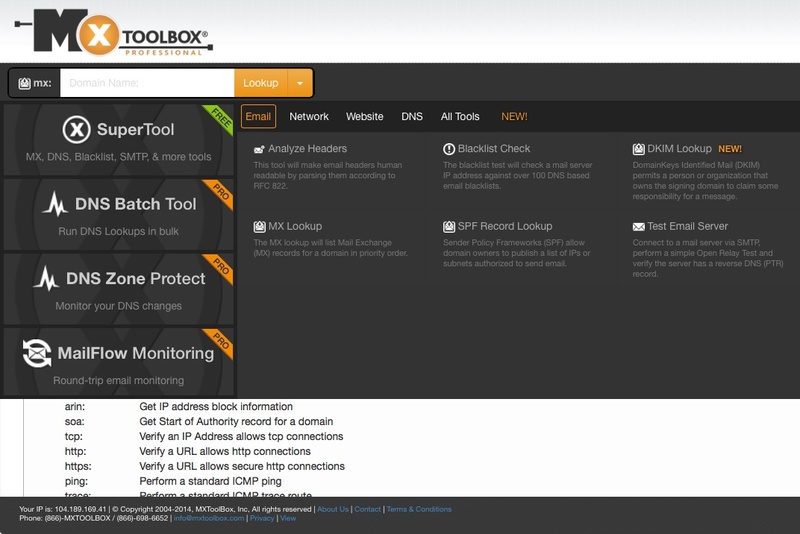 This entry was posted in Knowledgebase, Uncategorized and tagged DNS Tools on July 27, 2015 by MxToolbox Blog. Websites, servers, systems and pc’s all require passwords. Most people reuse the same password without thought, but that’s not a good practice in this day of data breaches. To prevent easy hacks, most sites require passwords fit a certain schema: capital letters, special characters, numbers, etc. Some require a longer passwords to make a cracking a password more difficult. Creating these can be difficult as can remembering a password you created on the spur of the moment. Easy to Remember – Creates passwords 8 characters long in a standard schema with a capital Letter, lower case letters and 2 numbers. These passwords alternate consonants and vowels to make them easier to remember. Stronger – Creates slightly longer passwords (10 characters) with a capital letter, special characters and numbers. Very Strong – Passwords in this category are 14 characters long and use multiple capital letters, numbers and special characters in a truly random configuration. Don’t like the 5 options we provide? Click the “Generate More” button until you find a password you like. Now that you can quickly generate a strong password, you just need a way to remember it! 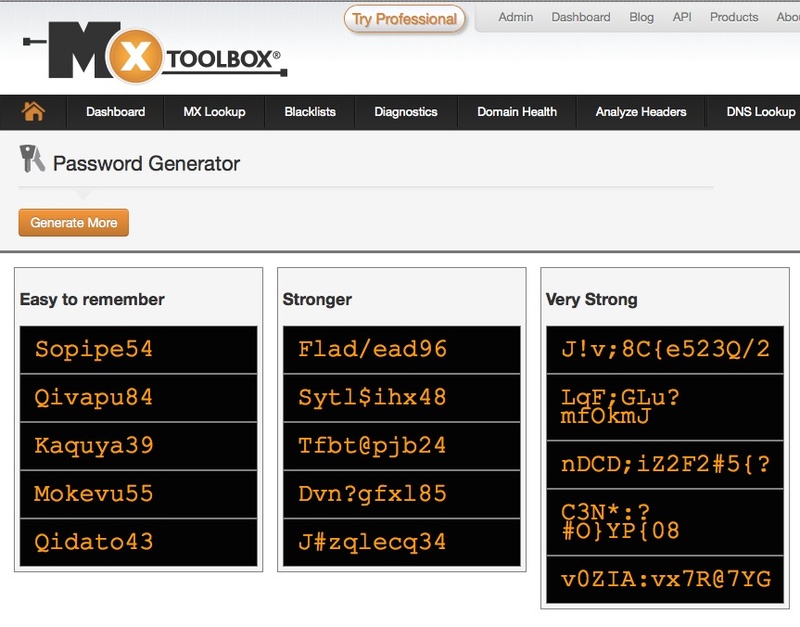 This entry was posted in Knowledgebase and tagged password generator on July 24, 2015 by MxToolbox Blog. How do I test my DNS resolution? DNS setup and resolution is important for your on-going business. Without properly configured DNS, your customers cannot find you online. It’s a pretty common story: You setup a new server and configure the DNS and you can see it on your network, but can anyone else get to your server? Everything isn’t setup and running until you check DNS resolution with an external 3rd party. Fortunately, MxToolbox provides free tools that allow you to check your DNS resolution externally, so you can verify what your customers see. Our DNS Lookup tool will return all the authoritative A records for a domain. This is useful to ensure basic DNS configuration. Our SuperTool contains a number of useful DNS lookups. 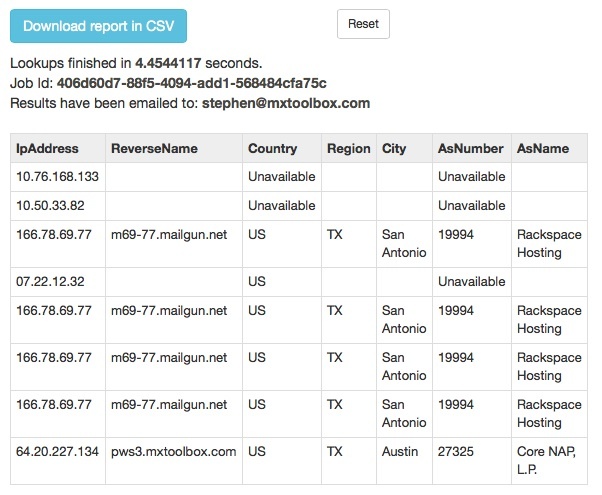 Most often our users check on DNS records for mail like MX, SPF, DMARC, and DKIM. However, we support the most common DNS lookups, including A, AAAA (for IPv6), PTR, SOA, TXT, LOC and others. SuperTool also includes a lookup (DNS:) for all the name servers authoritative to your domain so you can see them all at-a-glance. This lookup includes an analysis of the name server configuration compared to relevant RFCs. A la carte, DNS monitoring with MxWatch Monitoring packages. Starting at $20/month, you can setup custom DNS monitors for your systems and domains. These monitors alert you immediately if a record changes or servers fail to respond. Learn More. Turn-key DNS monitoring with Domain Health Monitoring. Comprehensive DNS Change Management and Security Monitoring with DNS Zone Protect. Our latest product constantly scans the entire DNS setup for your domain and alerts you when any change is made. Unlike traditional DNS monitors, DNS Zone Protect can detect the addition of new subdomains that could be the start of a Domain Shadow attack. Learn More. This entry was posted in Knowledgebase and tagged DNS, how to, Tools on July 21, 2015 by MxToolbox Blog.